The girls in rural areas are least encouraged towards education, especially in communities that are disadvantaged by caste and economic class. In addition, if the girls are from widow-headed households the opportunities for education are very limited. It is for such families, Buds of Christ is providing education support to orphan girls in rural areas. Encouraging education among rural girls means empowering widow mothers, realize the need for girl education, support the rural girls with life skills education to cope up with pressures and monetary support for educational materials and uniforms. The needs have been partially met through friends, partners and well-wishers of Buds of Christ. Over the last three years, Buds of Christ has been able to support orphan girls to continue education in schools and more than 20 girls have moved into higher education. Almost all of these girls are the first generation entry graduates. 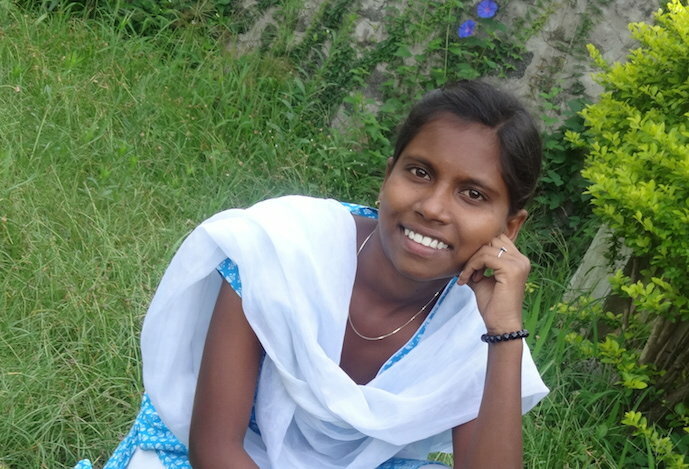 One such successful case of a rural girl out of the first generation graduates girls is Bharathi. Bharathi is the second daughter from a disadvantaged family by caste and economic status. Usually in such families, early marriages are encouraged with aged men, but with the strict laws against child marriage and our strong networking with the district child protection unit, these girls are safe-guarded. But girls from such families are not encouraged for higher education. Bharathi too faced such pressures, which she did not succumb and supported by her empowered mother. Bharathi's mother is a widow, not educated and managed the family by doing coolie work. When her first daughter was 17 years, she took the decision of getting married, against her mother's wishes, her mother got shattered. Next the pressure from relatives were on Bharathi, who was 15 years then and doing her 10th standard to be married . But her mother stood firm, and even against their relatives and encouraged to continue education with the support from Buds of Christ. Bharathi successfully completed her 12th standard and now is doing her First year B.Sc Nutrition and Dietetics and has completed her first semester examinations with first class. We at Buds of Christ would like to our friends for building the lives of young girls like Bharathi to see a better future. If not for your support, they would be in the same community with no opportunities for Growth.